Bollards. There, I've said it again! They are all over London and all sorts of different shapes. 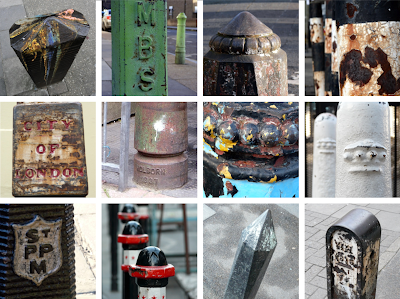 Some are there to protect pedestrians, buildings and corners; others have dual purpose as boundary markers. My 'collection' is quite pathetic compared to Maggie's set... she's bollard mad! Top: Caledonian Rd, Bow Common Lane, Hoxton, Acton. Middle: Carter Lane, Lambs Conduit St, Leytonstone, Holland Park. Bottom: Camden, Middlesex St, Highgate, Upper St.